The structural, optical, and thermal properties of PVC/SnO2 nanocomposites were investigated. XRD patterns were used to explore the structures of these prepared samples. Optical UV–Vis measurements were analyzed to calculate the spectroscopic optical constants of the prepared PVC/SnO2 nanocomposites. Both direct and indirect optical band gaps decreased with increasing SnO2 content. The refractive index, high frequency dielectric constant, plasma frequency, and optical conductivity values increased with SnO2. The single oscillator energy increased from 5.64 to 10.97 eV and the dispersion energy increased from 6.35 to 19.80 eV with the addition of SnO2. The other optical parameters such as optical moments, single oscillator strength, volume energy loss, and surface energy loss were calculated for different SnO2 concentrations. Raman spectra of the PVC/SnO2 nanocomposite films revealed the characteristic vibrational modes of PVC and surface phonon modes of SnO2. 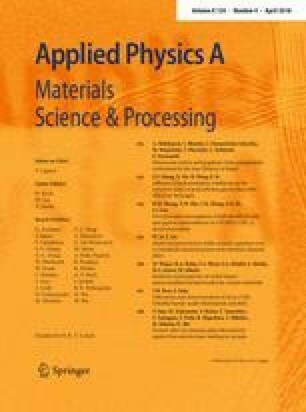 The thermal stability of PVC/SnO2 nanocomposite films was studied using DTA and thermogravimetric analysis. The glass transition (Tg) values abruptly changed from 46 °C for PVC to an average value of 59 °C for the polymer films doped with 2.0, 4.0, and 6.0 wt% SnO2. The weight loss decreased as the SnO2 concentration increased in the temperature range of 350–500 °C, corresponding to enhanced thermal stability.